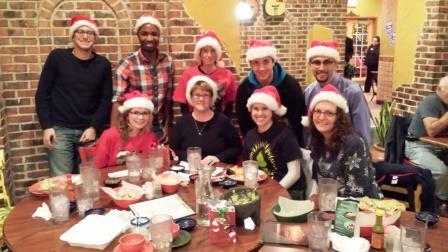 It’s now exam week, and our MSPL students are mostly done with their end-of-semester presentations. These presentations are a major checkpoint in the program, in which MSPL students defend what they’ve accomplished so far. For fall semester, our students’ end goal is to write a set of patentable claims. To do that, they learn about a completely new technology from a faculty inventor here at Notre Dame. Then they perform a patentability search in PATL 60111 (taught by Ron Kaminecki this year). Finally, they craft a claimset in their Capstone classes (PATL 60301, which I teach). These tasks are all things patent agents do on a daily basis — and are not easy tasks, for sure! Our students turn in the results of all of this work in a single document, and then put together a set of slides that they use to give a talk describing their findings. The students present to me, the faculty inventor, and the representative from Notre Dame’s Office of Technology Transfer who handles that technology. As I said at the top, almost everyone has finished their presentations by now — and everyone has done a fantastic job! It’s been very exciting to watch everyone grow and learn SO MUCH over the course of a single semester. Congratulations to everyone! 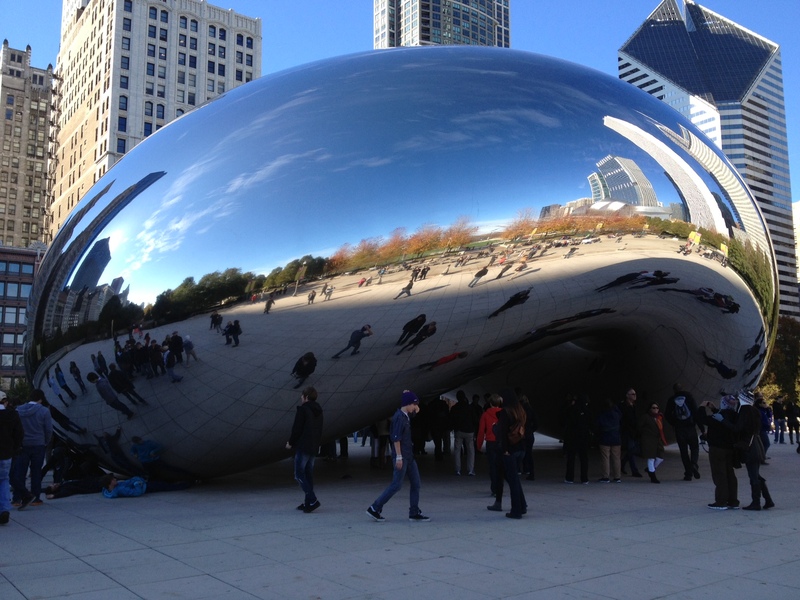 At the end of November, the Law School officially launched the new Chicago space. 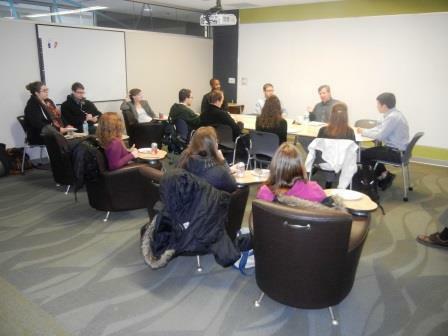 We hosted about 200 Chicago-area legal professionals. 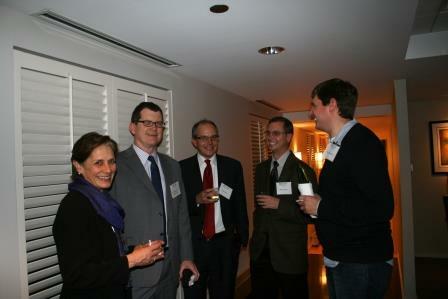 Of especial interest to the MSPL, several of last year’s patent attorney mentors joined us, as well as some new friends. 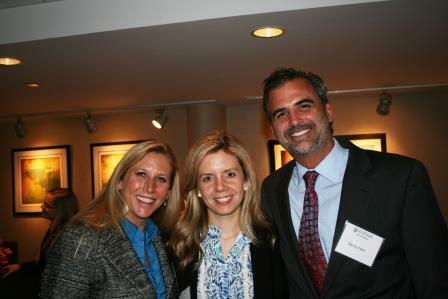 Keith Jarosik and Mark Galis from Greenberg Traurig were there. Keith mentored a MSPL student. 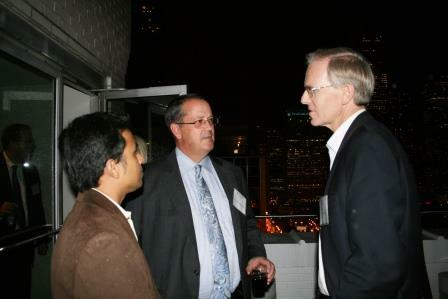 Also, Tom Donovan — another of our mentors– was there, pictured below with David Murphy (director of the ESTEEM program here at Notre Dame) and Sunny Shah (also from ESTEEM). A more recent acquaintance who was in attendance was Brian Goddard, who is at Cardinal IP. Also Barry Irwin, who is a patent litigator, and an old friend, was at the Launch Party, with his wife Ursula. Our last guest for the MS in Patent Law’s Football Friday lecture series this semester was Michael Sartori, PhD – chair of the patent prosecution practice at Venable LLP. Michael is a triple domer (BS, MS and PhD)… although he decided to go elsewhere for his JD. Michael talked to MS in Patent Law students about things to consider to create a successful career in patent prosecution. Among the pointers he provided: as a new patent agent, make sure you get to work on all of patent application drafting, patent prosecution and patent litigation; and make sure that your firm has processes in place for providing a quality product to its clients — which requires knowing how to serve the clients you work for. Michael has been a big supporter of the MS in Patent Law, from before it was ever officially created, in fact. 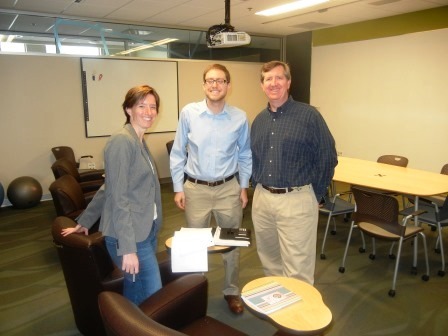 Thanks for coming to visit and talk to our prospective patent agents, Michael! About midway through each fall semester, we provide our students with a study aid, so they are more likely to pass the exam. Like for the GRE or LSAT, there are companies that provide study guides for the patent bar. We partner with PLI (the Practicing Law Institute, a not-for-profit organization) to give our students a solid study guide. This year, we were thrilled to be able to host Mark Dighton from PLI, who came to campus to talk specifically to MS in Patent Law students about the PLI course that they’ve gotten and how to study for the patent bar. 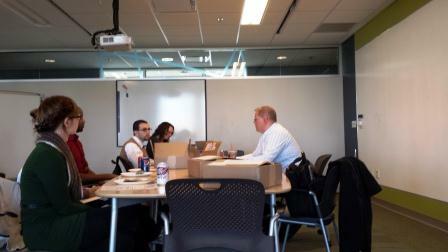 Mark, Rose, Travis, Joseph and Elaine — and the PLI courses in the boxes! Mark’s talk was really fantastic, and a good reality check about how hard the patent bar exam is. Thanks for coming, Mark! In the past few weeks, the MSPL has hosted several exciting guests. One visitor is Denise Mayfield, a partner at Thompson Coburn. 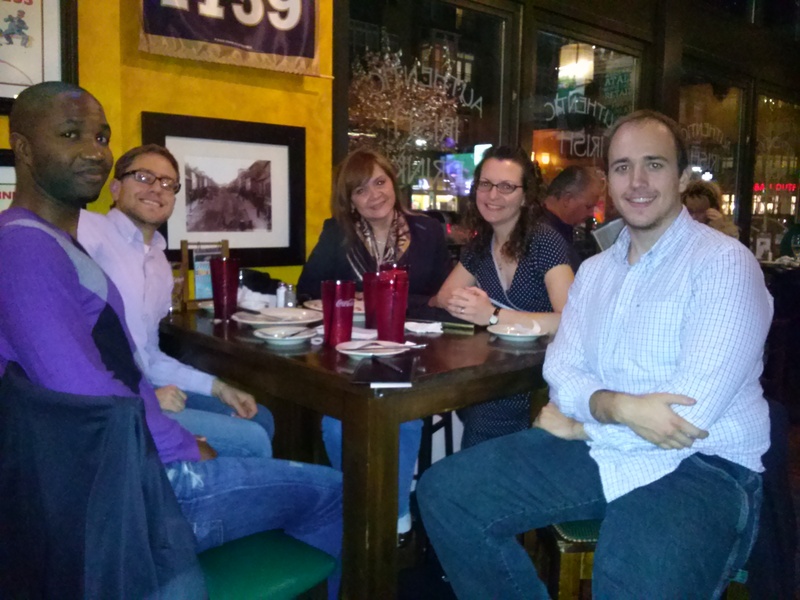 Denise was in town to assist with some issues regarding ND’s patent portfolio, and kindly took some time to meet with our students over dinner. Denise also was able to stay for a hockey game, and watched the Irish win!